TIP 3 - link directly to your district's data. Your district can LINK DIRECTLY to its own data in WISEdash Public by using the link icon at the TOP of any WISEdash dashboard. Use the BADGE CODE to directly add a WISEdash icon with the application link to your website. NOTE: Download the icon to your local drive if required. Q. What is the difference between WISEdash for Districts and the WISEdash Public Portal ? Overall, these two tools are meant to be used as companion tools. We suggest using the public version of WISEdash as your landing page and the first stop for data and information made available by DPI. When you are ready to do more analysis at the cohort or student level, jump to Secure Home icon in the footer to log into the secure district data. More information on the differences is listed below. WISEdash for Districts should be used if you are in a public school district, school, or DPI staff and have a legitimate educational need to access non-redacted summary and/or student-level data for data retreats, or if you will be analyzing the data to improve student outcomes. Tools available for Districts through Secure Home include: WISEdash, WISEid, WISEstaff, ASM, SAFE, IEP PTP, School Directory, and SPR. DPI released a public version of WISEdash in October 2013. It does not contain student data. 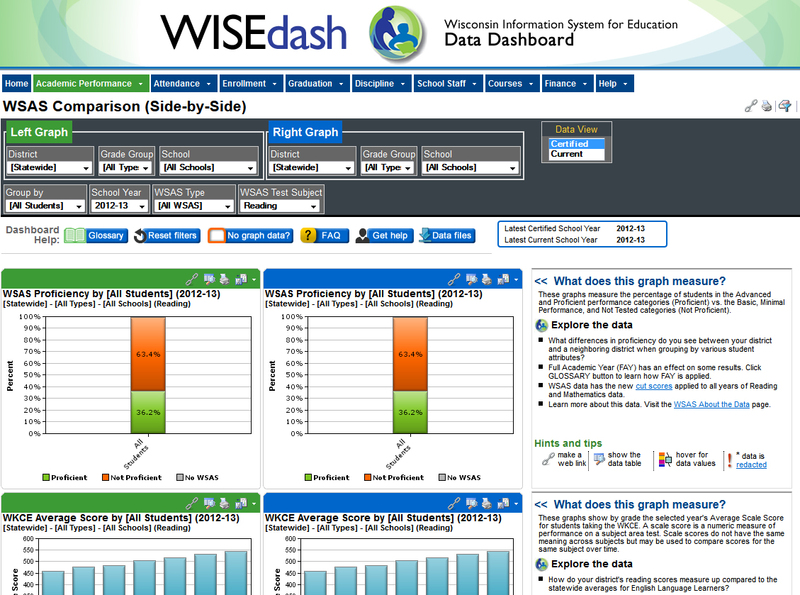 WISEdash is a data portal that uses "dashboards," or visual collections of graphs and tables, to provide multi-year educational data about Wisconsin schools. As a public reporting tool, WISEdash will be used by districts, schools, parents, researchers, media, and other community members to view data published by DPI. What's in WISEdash? Every year, all Wisconsin school districts collect information about their students, staff, and courses. These data sets are submitted to the Department of Public Instruction where they're stored in a data warehouse, a repository of millions of educational records that are linked and organized by school year. 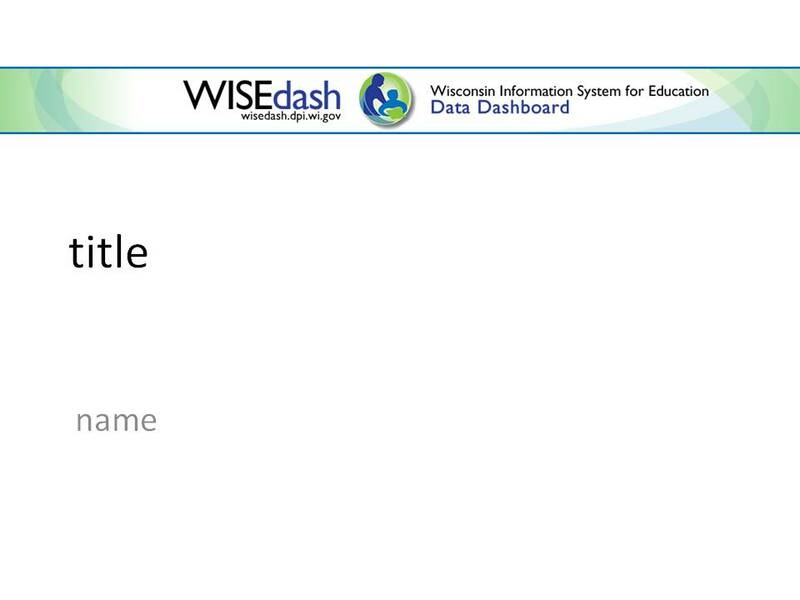 WISEdash gives you an interactive way to select and filter Wisconsin school data from the 2005-06 school year forward. Data are published by the Department of Public Instruction, and are redacted to protect student privacy. Additional historical datasets from 1998 forward can be downloaded. Links to other educational datasets and key reports are available in WISEdash. Who should use WISEdash public version? The WISEdash public portal is the front door for parents and community members to discover all types of data about Wisconsin schools and districts. Educators should send parents and community members to WISEdash for public data reports. WISEdash can also be used to compare districts, schools, and statewide data. Educators and school staff should use the secure version of WISEdash for student-level analysis. Why is WISEdash important? Education data is a primary tool to see how our students, schools, and policies are working. Over time, the data show the results of changes we make in schools, letting us track progress and make adjustments. As stated in Agenda 2017, the goal for Wisconsin is to help ensure every child graduates from high school prepared for both college and career pathways. WISEdash is a key part of Agenda 2017's assessment and data systems emphasis on giving parents and the public more timely, quality data to use for informed decision-making. Q. I am comparing publicly available data from the WISEdash Public Portal to data available through WISEdash for Districts but the data (counts and percentages) are not matching up. Can you explain why? You may find it beneficial to use both tools (see “When does it make sense to use the WISEdash Public Portal vs. WISEdash for Districts?” below). However, you should not expect the counts and percentages to exactly match up. Since it is a public reporting tool, data in the WISEdash Public Portal is redacted to protect the privacy of students. More information on redaction can be found on the WISEdash Redaction Information page. The WISEdash Public Portal is Certified snapshot data taken at a point in time while the secure portal is updated nightly from WISEdata. The WISEdash Public Portal removes certain student records for public reporting purposes that are not removed from the data displayed in WISEdash for Districts. These students include those students parentally placed in a private school receiving services at the district and students that have “aged out”. Enrollment Data: The WISEdash Public Portal reports Certified enrollment results as of the 3rd Friday of September as reported in the WISEdata data collection. Q. When does it make sense to use the WISEdash Public Portal vs. WISEdash for Districts? As a public reporting tool, the WISEdash Public Portal will be used by districts, schools, parents, researchers, media, and other community members to view data published by DPI. WISEdash for Districts should be used if you are in a public school district and have a legitimate educational need to access non-redacted summary and/or student-level data for data retreats, or if you will be analyzing the data to improve student outcomes. if you are looking for data not available publicly such as Student Growth, ACCESS for ELLs results and Postsecondary Enrollments.